CLICK ON THE PICTURE TO WATCH THE VIDEO. 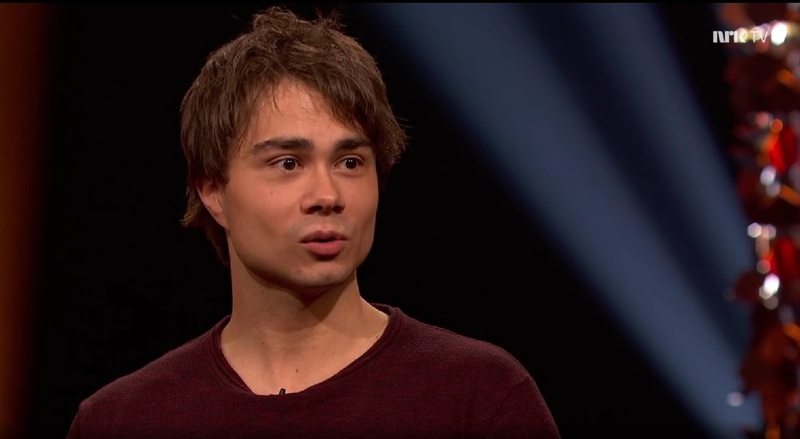 ALEXANDER APPEARS FROM 0 – 16 MINUTES. 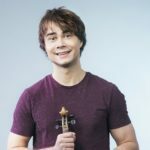 Alexander Rybak! Hi! Welcome. It’s 9 years since you made this the adventure when you won in Moscow, – – and made hysteria when you returned to Norway. What do you remember the situation on Gardermoen? At Gardermoen? It is just my favorite day. When I saw the people sea at Gardermoen, and instead of greeting everyone …I love people in general. Instead of greeting everyoneI had to break through. I had to go like this between four bodyguards. And they broke past children and old. I wanted to greet everyone. I invited people to a party as I broke me past. “Stupid, what’s up I did? “But I thought: I have invited people, and then I do not greet them. You wanted to stay there and have a kalas out in the Arrivals Hall. Yes, but was there somewhere there? You can not be forever and forever – – with 5000 people, maybe it is Gardermoen. -You had to run the party a little fast. -Hope people have forgiven me. That was at least a great feast to come to. The most beautiful picture ever. And now you will be Join in MGP, even you said last – that you should not do it several times. Do not know. 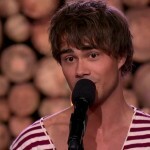 Jahn Teigen. I have always been a fan of him. But in recent years I have just become more and more fond of him. He has become my greatest idol. And I like Jahn Teigen approach to MGP. If you have something at heart, if you have a strong song you want to share, – – MGP is a fantastic scene. Spektrum and the whole of Norway are included. So if there is a message that I feel that I have this year, then it’s delicious – – That’s the message reach even more via MGP. Jahn has been generous with himself. It has gone bad, awesome, awesome … Do you also think that’s okay? -It’s not just okay. That’s the only way to do it on. No matter if you move on, – must continue to challenge self and dare to please others. If you have it Believe that’s what you do. You can look at it as a kind of NM. You can be with each year. You do not say that to the German foot- ballaget: “You won 4 years ago.” “Do you dare, then?” Thank you. When you won in 2009, it was the start on a great international career – – which we do not add so much notice in Norway. But you are very much out in the world. How much are you traveling and traveling? In addition to having had 48 Christmas concerts just now, – – Have i been in 20 countries in 4 months. It is quite violent route you put on then. Since your parents are from Belarus, do you speak Russian. You can give interviews in Russian or give out songs in Russian. That’s the key when you reach addressed to the audience eastwards. present some little glimpses – – of your life as Eastern European pop star. 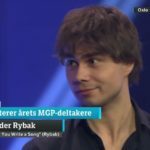 Alexander Rybak in his own person. This is a version of you here which we do not know so well. Also the last lady with flowers on your head … it’s you? -Yes. -Reday about that program. It’s a “Every time we meet “on steroids. You do not try just dressing up like people. But you get plastic on your face, and you get … what is it called? Do not make up, but you get stuck on it. So you dress up as an artist you should shout? Yes. And then there are more participants and a winner in the end. It is quite similar. We have pictures of you and this russian singer. -Ljudmila Rjumina. -Look at this. It’s not so late. Did you enjoy yourself? Was it fun to be in a row? Another time I was Gloria Gaynor. I have been Elvis and Gloria Gaynor. It was not just Russian celebrities. It was great fun. “Every time we meet” – they do not understand. That I present my new single in front of 6 people eating soup. They thought it was a little small? You are on a massive TV show and concerts. Do you say no to things? Have you said no to fat offerings from Eastern European countries? They wanted me to join the Hungarian. Or is it called Bachelor? I said no. And those double and double the fee. In the end it was 950 000 euros. But no matter how much money that’s what’s wrong with that – – what to live with afterwards Someone is wearing it. But now I had had 8 million in debt – – because no one had taken me seriously after that. And maybe I had a little less chance of my dear Julie, – – which I’ve been with in 2 years now. So I’m very pleased. She is sitting here in the hall, I hope. It is good. How is it like to have such parallels worlds that you can be in? Do you notice that there are others expectations for you in Russia – – than it is in Norway? Yes absolutely. It is different norms. Not rules, but …Expectations. I’m on the subway in Azerbaijan to get me faster …First of all, there is none who wants to talk to me. -All people look mad at me. Then I realize it’s rude to take subway in some countries. Everyone wants to become famous, to get richer. When someone has achieved some of it, they are seen — that it is rude to live like them. Now I exaggerate that. I understood fast that different countries have different standards. In Norway you have to snob down. Here you have to take the subway. You can not drive and drive around the limousine and think you’re something. I like much better the approach we have here. It is much easier to have legs on the ground. You sometimes feel that it works in Belarus, gets fermented here. When you stood up on the picture with Lukashenko, – – Was it a little bit controlled here at home. There were many unforeseen things there. It’s one of those I remember most. Did not you think people would think you can not do this here? It was a miss competition like was organized by the presidency. So I got criticism for that, and I understand why. Do you have to think carefully about what you can do because these two worlds meet? First and foremost, I’m lucky. I have a career in Scandinavia. I have a career in Eastern Europe. In the whole world there is Scandinavians and Eastern Europeans. But there are different cultures, different ways to think about. – that the most beautiful girls The whole world is gathering here. Then some Russians come and analyze what I said. is immediately translated – – by some stubborn fans out there. So they spread it on fan sites everywhere. So I hope I have been a nice boy now. You have been nice boy. I think this is going well. Now you’re ready for MGP soon. The song is ready. I’m ready now. What kind of heating do you need until March 10th? I challenge myself very much. It is less trouble and a little more movement. 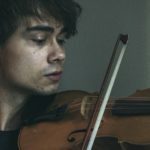 I notice it when I recorded the music video – – that it is a strain on the condition. Now I drive and train that the three minutes will be easier. I’m watching a lot at football at home.And then I run on the spot. I stand and trip. And then waiting I. And then I sing a chorus. And then I run again. And then I sing a chorus. I’m trying to do it while I’m breathless. If I can, I will do that it’s very good at Spektrum. And I think The fans will be very pleased. We look forward to seeing you on this adventure with you – – once again in MGP. Thank you that you would be with us here.